HomeFashionBollywood inspired ways to wear white to your Holi party this year! Holi is one of the most prominently celebrated festivals in India. Apart from being known as the 'festival of colours' it is also known as the 'festival of love'. It signifies the victory of good over evil, the arrival of spring, end of winter and also a day where you get to meet family and friends and have a good time with them. We're sure that like every year, this year too you've been invited to a Holi party. And we're also sure that much like every year, you still don't know what to wear. Well, fret not, for these Bollywood inspired attires are sure to come to your rescue. Take a look for yourself and then choose your pick. If you're looking for something that's chic but also keeps you comfortable throughout the party, then you have to opt for something like Alia Bhatt's stunning white chikankari suit. Trust us, it's something so simple yet so elegant and beautiful. Team it with a pair of ethnic jhumkis to take it to the next level. Looking to take things up a notch at the party? Try something like Shilpa Shetty has with her unique and gorgeous concept saree. Not only is the blouse differently styled but even the pallu has a unique twist to it. You're bound to grab eyeballs with this one. Team it with a pair of pin-heels and you should be good to go. Try something different this Holi and opt for something trendy like Kriti Sanon has. Her jumpsuit featured frills on the top and harem pants for the bottom which we think is totally unique. Style this one with a pair of juttis and a thick chunky ethnic necklace for added drama. Deepika Padukone sure knows how to step out in style. If you'd like to look as elegant as possible, we suggest you opt for something like she has. Her gorgeous embroidered saree was teamed with an embroidered blouse. And despite being so simple, it looked so beautiful. Team your ensemble with a bold red lip and you're sure to grab attention. So, which look are you going to opt for? Priyanka Chopra Jonas’s sheer polka dot number and top-knot has the potential to be your uniform for summers! Alia, Deepika and Katrina paired the pink and red, who stole your attention? Sara Ali Khan's latest outing in Topshop proves she's on her way to becoming the next fashionista in B-town! 'Koffee with Karan': Priyanka Chopra Jonas and Kareena Kapoor Khan turn up the glam! 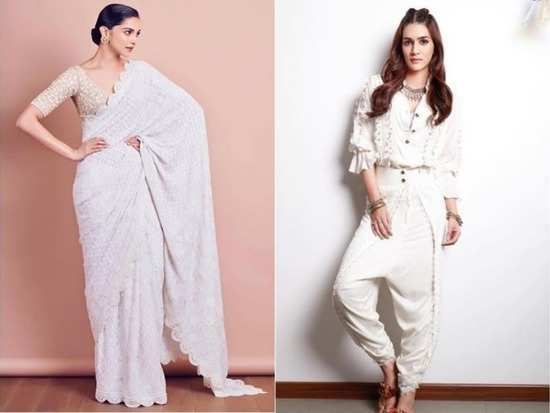 1Bollywood inspired ways to wear white to your Holi party this year! 2Priyanka Chopra Jonas’s sheer polka dot number and top-knot has the potential to be your uniform for summers! 4Alia, Deepika and Katrina paired the pink and red, who stole your attention? 9Sara Ali Khan's latest outing in Topshop proves she's on her way to becoming the next fashionista in B-town! 10'Koffee with Karan': Priyanka Chopra Jonas and Kareena Kapoor Khan turn up the glam!